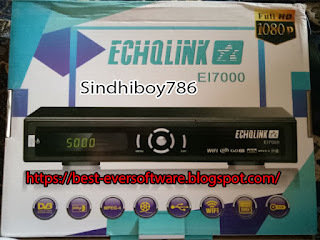 Echolink El7000 HD Sim Reciver is very fastest in cccam shairing as well. Echolink El7000 HD Sim Reciver is very easy in use. It supports 4MB flash file. I am sharing here with you both software. 1st is one dump file and 2nd one latest software file and also latest softcam. You can download from link below. Please aap board number batain kya hai. Agar mere pass hoga to zaroor upload karoon ga.
Bro i have echolink El7000 wifi 3G supported hd reciver hai us ka working software hai to please link send karen.